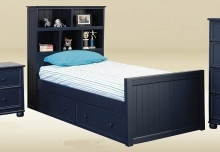 eFurnitureHouse.com carries a complete line of children's bedroom furniture sets online. Create a look for your child's room that is unique as they are with our great selection of children's bedroom furniture. 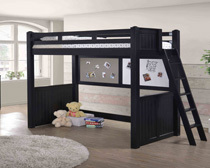 Our collections include kid's teen twin beds, full or double size beds, kid's bunk beds, trundle beds and loft beds. Twin beds are the most popular, followed by full size Captain's beds and storage beds. Cottage style and sleigh beds for kids are available in seven finishes; birch, black, blue, walnut, pecan and white to complement most bedroom decor. 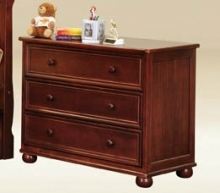 Matching dressers, chests, computer desks, and night stands will compliment the bedroom decor and provide extra storage space. 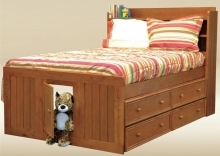 Full size Captain's beds with trundle offers a great sleeping solution for a sleep-over with friends and family. 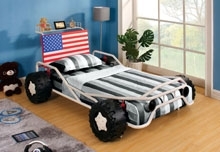 Our collection includes many unique and cool beds that turns a child's bedroom into a happy place. If space is an issue, we carry bunk beds for kids and youth in both wood and metal. Captain's beds with under bed storage are available in both twin and full size and in a range of finishes. Enjoy browsing our fabulous collection of children's bedroom furniture.